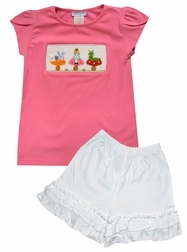 What an adorable shorts set by Vive La Fete for your little girl! 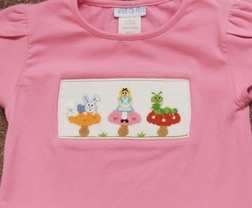 It is made with a soft, hot pink shirt smocked across the shirt with 3 Alice in Wonderland characters; the Rabbit, Alice and Absolem the caterpillar. They are hand embroidered in the smocking. 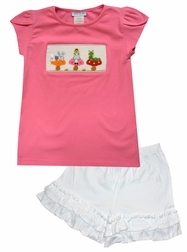 The shirt is paired with soft white shorts with ruffles.